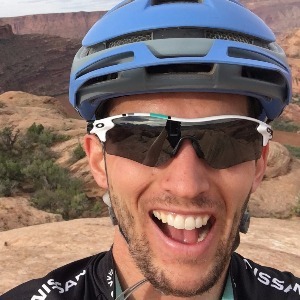 Dane is a certified USA Cycling Level 2 coach and is has his Level 1 Training Peaks accreditation. In college, Dane was the Inter-mountain collegiate conference road race champion and competed at nationals. If you want a hands on coach to be there most of the time to help you through the pitfalls of training. Dane is your guy. Dane's dynamic coaching plans are unique and tailored to his athletes. Dane is best when he gets to coach one on one to help clients achieve their goals. I grew up in Utah. I've been biking for over 25 years. I can remember going to Moab with my family on bike trips when I was only 6 years old. I've gone from weekend warrior to elite racing and all stages in between. I graduated with two degrees from the University of Utah(Accounting and Information Systems). My wife and I just moved back to Utah after spending 2 years at working with the Walt Disney Company. My wife and I have a beautiful little girl whom we love spending time with. My passion is cycling and helping athletes achieve their goals with a well rounded lifestyle plan. I understand first hand the struggle we have with our time. From family to racing, studying and business. I can help you manage your training to achieve your goals. I'll take any athlete: size, racing capabilities, beginner to professional. Success. Coach Home has been notified of your message.